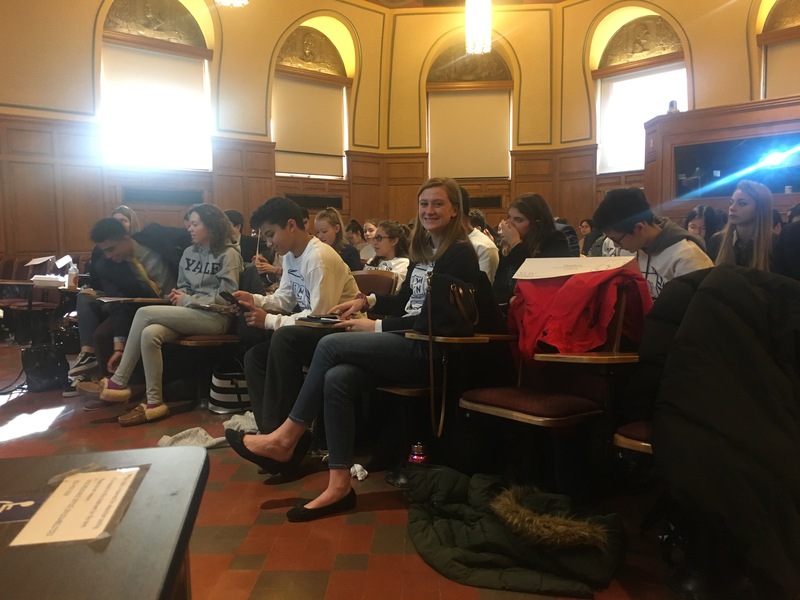 The Model UN club packed their bags and headed to Yale for the YMUN XLIV conference from January 18th-21st. This is the second YMUN event the Model UN club attended. 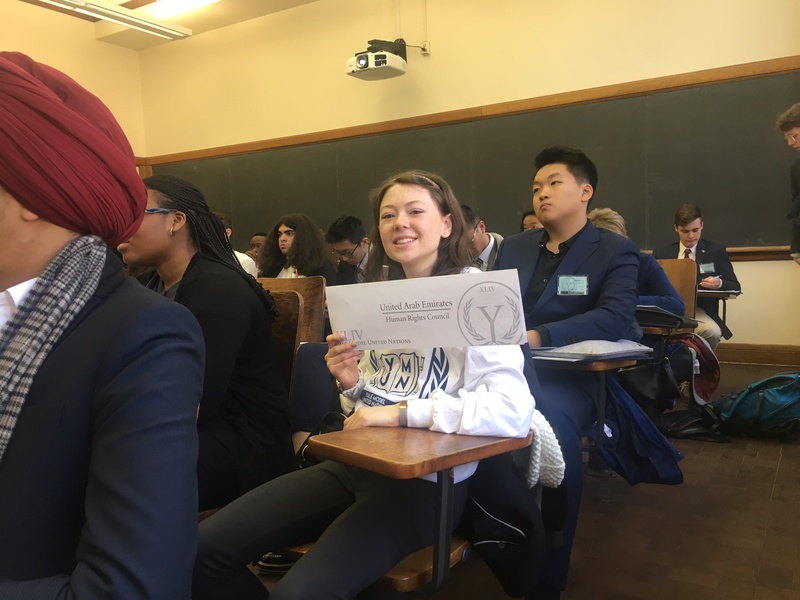 Junior Ella Franzoni started the Model UN club two years ago. When Ella considered going to Mercy, she found out that they had a good Model UN team. When she decided to go to Morgan, she brought the idea of a Model UN team to Morgan. When the club first started there were only four students, but this year the number of students involved has more than doubled. Ella Franzoni at her committee meeting. Students from different schools all around the world come to Yale for this convention. Each school is given a country. Each student is assigned to a different committee. The students research the country’s issues on their assigned topics. Topics include education, refugee crisis, disease, poverty, politics, environment, nuclear technology, and others. There are thirty-six different committees; IAEA(International Atomic Energy Agency), UNESCO(United Nations Educational, Scientific, and Cultural Organization), NATO(North American Treaty Organization), Press Corps, and United Nations Security Council which are real committees in the United Nations. 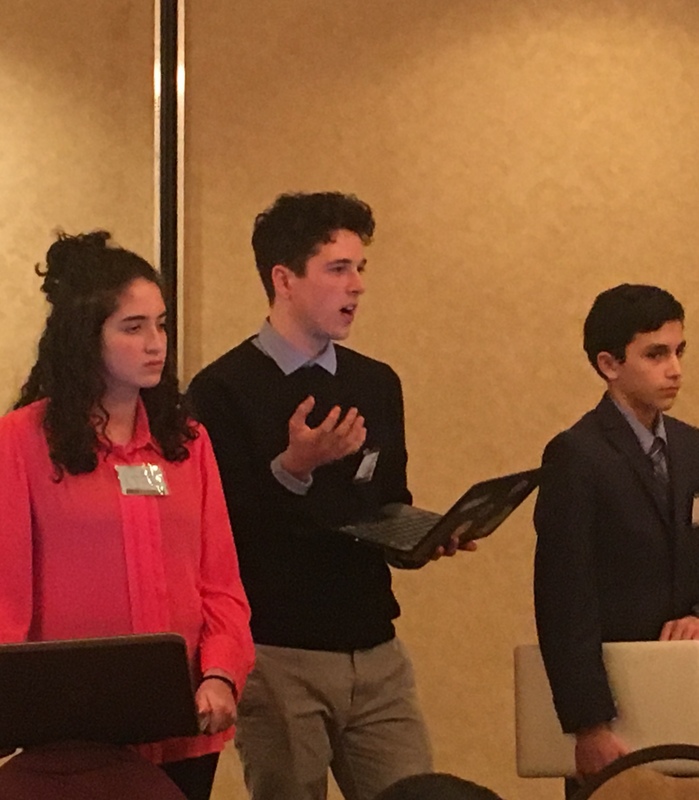 This year the Morgan students represented the delegations of Nicaragua, Nigeria, the United Emirates of Arab, and Venezuela. Students are separated into different rooms. In each committee, students will present their country’s issues on their committees’ assignment. These committee meetings occur in multiple places like the Omni Hotel and on the Yale Campus. These meetings can contain a range of 15-95 students. Wyatt Reu at his committee meeting. Senior Wyatt Reu joined Model UN because he claims he wanted to “get more experience with stuff involving diplomacy outside of school, and Model UN is an opportunity for students to learn about international studies and foreign policy.” Wyatt Reu learned a lot about what people all around the world think about issues that are interesting. Sophomore Sarah Auletta joined because she wanted space where she could openly debate different topics that were interests of hers and could debate with other people from around the world. Sarah Auletta claims “that Model UN is different from other clubs because you get the opportunity to go and meet people from literally the other side of the world such as Japan and Australia.” Sarah’s most memorable thing since joining Model UN is making a connection with people from the other side of the world and maintaining that connection and learning about their lifestyles. Sarah Auletta at her committee meeting. The adviser of the Model UN trip is the U.S. and World History teacher Emily Russell. She was asked to be the adviser of the club by senior Wyatt Reu and junior Ella Franzoni. She claims her favorite part about going to Yale is “seeing the students have such a great experience and discussing global issues.” Ms. Russell explained that the students “find real-world solutions for global issues and meet and interact with students across the country and around the globe.” Ms. Russell sees the club growing in the future and hopes to go to more conferences. So very proud of these Morgan students!! They are indeed our future! !